In this scenario, rooftops are being covered with waterproof membranes and reinforced to support the soil and drainage necessary to raise plants on an ongoing basis. The choice of vegetation can be as simple as prairie grass or as complex as a mix of flowers, grasses and even small lightweight shrubs. The good news for the asphalt industry is that its products have a real place in the movement – because asphalt roofing materials combine reliable waterproofing with durability and ease of application. What exactly is a green roof? For a precise answer, we turned to Wolfgang Ansel, Director of the International Green Roof Association (IGRA). Functionally, a green roof system consists of a waterproof membrane, a protection mat to keep out plant roots and rain water; a drainage board, a filter sheet and substrates/soils that are selected to suit the vegetation to be grown. Green roofs are nothing new. “In fact, they go back to the Hanging Gardens of Babylon,” said Tim Barrett. He is President of Barrett Company, plus a Registered Roof Consultant (RRC) and a Registered Green Roof Professional (GRP). According to Barrett, green roofs retain 75-80 percent of the rainfall they receive. 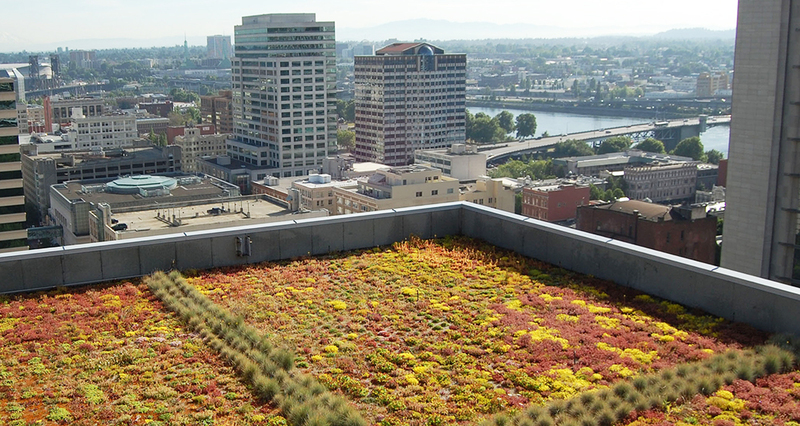 Storm water control is just one benefit that green roofs provide. “It is generally recognized that the vegetation/soil components of a green roof will capture a variety of components commonly found in rain water such as heavy metal ions and nitrogen,” said Kirby. In summary, “green roof benefits include the protection of waterproofing, water retention, thermal insulation, improvement of the climatic environment as well as new natural habitats for flora and fauna,” said Wolfgang Ansel. Asphalt products are proven to be effective roofing and waterproofing materials. Hence it is not surprising that asphalt products have been embraced as a prime waterproofing option for green roofs. Many commercial contractors offer a range of green roofing options and rely on asphalt-based fluid applied roofing and waterproofing membrane to make them last for decades. On the job site, the fluid is heated in an agitated melter and then spread onto the roof deck and walls. For extra strength, the applied asphalt is reinforced with spun bond polyester and neoprene flashing that creates a 215-millimeter thick protective waterproof membrane. This is both thicker and stronger than conventional EPDM rubber and plastic sheeting. The membrane can expand and contract with the seasons without compromising its structural integrity or its ability to resist water and root penetration. It can also withstand the deformation caused by numerous layers of green roof materials resting on top of it, for years at a time. Other forms of of rubberized asphalt waterproofing do not require heating before application, and can be used over green concrete. Combinations can provide full adhesion to the substrate and chemically fuse to form a thick, semi-monolithic waterproofing membrane. As the greening of roofs trend grows, one can expect newer and even better asphalt-based products to enter the market.